David T. Smith aka Mr. Summerfruit Cup reports for Gintime on his visit to The Feathers Hotel the day the Guinness World Record team arrived. What is already proving to be a rather gin-filled June (with World Gin Day on the 9th) started with a trip to the village of Woodstock, Oxfordshire. My destination? The Feathers Hotel. From the outside, this boutique hotel looks cosy and quaint; you would never guess that it contained the World’s Biggest Gin Bar, but, with Guinness World Record coming to adjudicate a count that very day, that was exactly why I was there. The record for “largest collection of commercially available gins” was being set for the first time and Guinness had set the bar at a reasonable 100; The Feathers were aiming for 163. To kick off the day, we were treated to a pre-lunch tasting with Martin Miller’s Gin with brand ambassador, Liam Murphy. Sloane’s Dry Gin were also on hand to offer people a taste of their gin and a chance to try some of the individual distillates are used to make it. Chatting with The Feathers’ Head Bartender, Nuno, I got a chance to sample one of the rarest gins at the bar: a bottle of Japanese Suntory Gin from the late 1950s. Given that it is over half a century old, it has survived very well and was in almost tip-top condition. I noted that it was quite mellow, but with lots of flavour; it was strong in the classic gin notes of dry juniper, coriander and some earthy herbal notes. It was very complex with a long finish and liked by many tasters, even those who don’t usually like their gin neat. For such a monumental occasion, The Feathers Hotel’s Head Chef, Kevin Barrett, created a special version of their Gin Experience tasting menu. Food and spirit/cocktail pairing is becoming increasingly popular and The Feathers do it brilliantly. Our special lunch consisted of five courses, each containing or accompanied by a different gin. Although the whole meal was superb and well-matched with both the wine and spirits, there were two particular highlights for me: the scallop course and the dessert. The former consisted of diver caught scallops with tangerine, fennel and lime jelly and was accompanied by an ice-cold shot cleanser of Tanqueray Rangpur. This is easily the best way to drink Tanqueray Rangpur, with the citrus and fish being a naturally good combination (the cleanser also works well with cevíché of yellow fin tuna, scallop and lime jelly, which is on the regular Gin Experience menu). Even folks who hadn’t liked Tanqueray Rangpur when they’d tried it previously were delighted with this dish. For dessert, we had conference pear tarte with almond strudel and Sipsmith caramel, served with Sipsmith Sloe Gin. The sloe gin was absolutely delicious and, with its refreshing tartness, perfectly offset the array of sweet treats on the slate before us: rich, juicy and strikingly sweet pear; perfectly flaky pastry in the almond strudel; and crunchy pear batons. After lunch, we made our way to the bar to witness the all-important count. In order to qualify, each gin had to have been stocked and on sale in the bar for six months before the count date. There was one hairy moment when one of the bottles couldn’t be found, but it turned out that this was due to a typing error on the inventory. 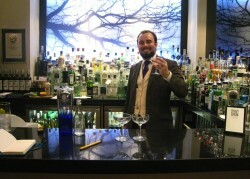 After 45 minutes, the announcement was made that The Feathers Hotel had set the world record with a staggering 161 gins! With their successful bid for the Guinness World Record and the array of other fine gin establishments across the globe, The Feathers Hotel’s Gin Bar have really thrown down the gauntlet; who will pick it up?